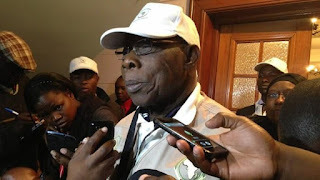 Chief Olusegun Obasanjo, Former President, says he will never return to the Peoples Democratic Party, PDP. He disclosed this to newsmen after a meeting with the National Caretaker Chairman of the party, Senator Ahmed Makarfi, behind closed-doors which lasted for one hour. The meeting was held at the Olusegun Obasanjo Presidential Library, Abeokuta, Ogun State. The former president said returning to PDP is tantamount to going back to his vomit. “I will never return to the PDP, just like a dog would never return to its vomit,” he said.